Atheism: Proving The Negative: What Exactly Do You Want From Me? Do you think 1) that once all the relevant arguments, evidence, and background issues are adequately considered, a reasonable person is obligated to conclude that God is real, or that Jesus was resurrected from the dead, or some other central tenets of modern orthodox monotheism are true? Or do you think 2) that once all the relevant arguments, evidence, and background issues are adequately considered, it is epistemically permissible for a reasonable person to believe that God is real, or that Jesus was resurrected from the dead, or some other central tenets of modern orthodox monotheism? Endorsing 1), as I see it, will also commit a person to saying that to be an atheist or agnostic, once he has considered all the relevant arguments, evidence and background issues is unreasonable. Evidence sharing epistemic peers who are atheists and agnostics ought not believe what they believe. Endorsing 2), as I see it, places no similar demand or charge of epistemic culpability on the non-believer. If you think merely that it is not unreasonable to believe, given all of the relevant evidence, then you are allowing that a reasonable, evidence sharing peer might well draw a different conclusion and be within her epistemic rights, as it were. So theists, which is it? Do you think that I have made some serious error with regard to the total available evidence concerning God and that I ought to change my mind? Or do you merely think that your believing on the basis of the available evidence is epistemically permissible, but someone could opt not to believe and he would be similarly inculpable? This posting is quite interesting, I have been in a YouTube discussion on Father Barrons (Fr. B) channel “Against the YouTube Heresies” with Fr. B and a user by the name of Philip from the UK. Fr. B and Philip defend the Catholic faith and I am atheist. Fr. B rigorously defends the argument from contingency. Fr. B claims to have an S.T.D. (not the sexually transmitted disease) from the Institut Catholique de Paris. Philip was intelligent but apparently did not have a formal education in Philosophy or Theology. I have a minor in Philosophy with three terms of Philosophy of Religion. I could assert that we are epistemic peers. I successfully defeated their contingency argument by showing that even if there is a necessary non-contingency grounding of contingency that does not lead to a triune God. My first argument was that if there is one non-contingency then there are many (Aristotle’s third man argument). My second line of attack ,the cosmological argument does not get you to a God by itself, there has to be a successful ontological argument also (Gale 238, On the Nature and Existence of God). Neither Fr. B or Philip was able to develop this line of thinking (I did write a combined cosmological and ontological argument that lead to a conclusion that some sort of Deity was possible). The conclusion to the exercise was for Fr. B to retreat without admitting defeat. Sharing evidence did not change any beliefs, neither theirs or mine. There is “Reasonable Religious Disagreements” (Feldman). You ask a number of interesting questions. I will give you my personal opinion. 1. Do you think 1) that once all the relevant arguments, evidence, and background issues are adequately considered, a reasonable person is obligated to conclude that God is real, or that Jesus was resurrected from the dead, or some other central tenets of modern orthodox monotheism are true? No. I do not believe it is possible to prove the existence of God in a final sense. I do think it is possible to show that belief in the existence of God is reasonable is probably the best explanation for all the evidence as a whole. 2. Or do you think 2) that once all the relevant arguments, evidence, and background issues are adequately considered, it is epistemically permissible for a reasonable person to believe that God is real, or that Jesus was resurrected from the dead, or some other central tenets of modern orthodox monotheism? Yes. Based on all the available evidence, it is reasonable to believe God is real, the creator of the universe who came to earth in the person of Jesus Christ and rose from the dead. 3. Do you think that I have made some serious error with regard to the total available evidence concerning God and that I ought to change my mind? First, I do not think you are in possession of all the available evidence. That is not meant to be insulting. I don't think anyone is in possession of all the available evidence. Second, yes I think it possible you have made an error or two. For example, if you think any of the Incompatible Properties Arguments put forward by Drange are valid, then you are mistaken. Third, certainly I would like to see you change your mind in the same way Anthony Flew, CS Lewis, Francis Collins, Alister McGrath, Allan Sandage and Lee Strobel have. Since I do not believe absolute proof of God's existence is possible, I would advise you to consider taking Pascal's Wager - as Allan Sandage did - and the doubts then go away. Are you willing to follow the evidence wherever it leads? The only reason an apologist can deny the incompatability of immutability vs. omniscience, is they have the option to change the meaning of each predicate. This is theology gerrymandering. Pascal starts from a position of metaphysical ignorance. We just don’t know anything beyond the realm of experience. The set-up of the wager presumes that we do know something. The wager is a prudential concept like flood insurance. PS, I would be really impressed if you can explain how Pascal solved the problem of the points. I see you approve of the immutability vs omniscience argument. This argument fails because the nature of God and timelessness is misunderstood. You claim the only way to defeat the argument is to change the definitions of the predicates. i disagree. The only way to confirm the argument is to be able to show the definitions used are consistent with clear statements from the Bible or with the majority of Christian theologians. 2. If God exists, then he is omniscient. 3. An immutable being cannot know different things at different times. 4. To be omniscient, a being would need to know propositions about the past and future. 5. But what is past and what is future keep changing. 6. Thus, in order to know propositions about the past and future, a being would need to know different things at different times (from 5). 7. It follows that, to be omniscient, a being would need to know different things at different times (from 4 and 6). 8. Hence, it is impossible for an immutable being to be omniscient (from 3 and 7). 9. Therefore, it is impossible for God to exist (from 1, 2, and 8). A. The origin of the planet earth is in the past. B. The end (or destruction) of the planet earth is in the future. The claim is that a timeless being need not know propositions A and B in order to know everything there is to know, because such a being could know the exact dates of both the origin and the end of the earth and that would suffice for complete knowledge. That is, A and B would be "covered," and so it would not be necessary for the omniscient being to know A and B in addition to those dates. But, of course, this claim can be challenged. To know the dates of the origin and the end of the earth does not entail knowing propositions A and B. To know A and B requires being situated within time (somewhere between the origin and end of the earth), so they are not anything that a timeless being could know. However, they certainly are things that an omniscient being must know. Thus, the given objection to premise 4 of the argument above is a failure. Premise 1 and 2 are fine. Premise 3 is the first problem. It is nonsensical. It is not required by either logic or the Bible. It is not claimed by any Christian theologian. It is simply wrong. Premise 5 is unclear. Is this claiming that what is past and future is changing because as time passes, things once in the future are now in the past? If so, this is not a problem for a God who is timeless and knows everything that has happened or will happen within the spacetime we call our universe. Premise 6 is completely muddled. A timeless God, while able to invade our spacetime, is not under the restraints of spacetime as we are. No Christian theologian in the history of the church has ever claimed God was under the restraints of time. If he was under the restraints of time, then he would not be omnipotent. The argument is fatally flawed. It rests on an improper, unbiblical and non-theological view of God. Any argument that wishes to disprove the existence of the God of the Bible has to define God's attributes consistent with clear statements in the Bible or at least consistent with teaching agreed upon by Christian theologians. Not a single one of Drange's arguments holds up to the slightest scrutiny. When analyzing all of the evidence for God's existence and all of the evidence against his existence, there are four possible positions. 1. God's existence is proven fact. 2. God's non-existence is proven fact. The final two position are reasonable. The first two positions are unreasonable. I say they are unreasonable because in the history of philosophy no one has succeeded in proving either God's existence or his non-existence. As Feldman says, reasonable people can sometimes take unreasonable positions. You must have big cojones or be incredible naïve, to think that a PhD that wrote the entry for Atheism in the Internet Encyclopedia of Philosophy, would not under Pascal Wager, or the justification of knowledge regarding beliefs. scripture as authoritative. Therefore... It is not appropriate to cite scripture or the Biblical God in an argument. Drange, as a philosopher, understands the standard theist conception of God. Therefore, Drange’s argument is not only valid it is sound. You have confirmed my criticism of apologetics. Apologist can define or redefine Gods attributes at will. Please explain how Pascal and Fermat solved the problem of the points. I am not familiar with the problem of the points. Your first sentence is confusing. I believe a word or two may be missing, but I must admit to both charges. I have large cojones and I am sometimes naive. But I am not wrong on this argument. Regarding sentence two, I am not assuming Matt has any regard for scripture. I am assuming he, and you, understand a straw man argument is invalid. You cannot say "Here is what Christians believe..." and then tear down the argument without making certain you state the Christian argument correctly. Drange has failed to understand the nature of God and timelessness. Again, I am not attempting to redefine God's attributes. I am stating clearly that Drange has misunderstood them. If you believe Dranage has it write, then point to passages from the Bible or Christian theologians who use Drange's definition. You have thousands of years of church history and theological writings to use to show Drange's definition was held prior to my arriving on the scene. You cannot do it. Because you cannot do it, the argument fails. I hate homonyms when I'm typing quickly! Pascal is the father of probability. The points is an ancient problem in game theory. Anyone who is interested in the history of mathematics and probability will study the solution. I bring it up, because it shows how to think critically. As a student of Philosophy, I do not consider any scripture as authoritative. Therefore, if you want to argue about God and time, you need to cite Boethius (c. 475-525), in his works The Consolation of Philosophy or Professor Wolterstorff’s essay God Everlasting. Epicurus (341-270 BCE) is credited with the first argument from evil. You fail to understand that Christianity is directly related to Hellenistic Athens (all extant MSS of the NT are written in Greek). If you read Augustine it is obvious he is a Neo-Platonist and Neo-Platonism was a major influence on Christian Theology. Drange received his PhD from Cornell in 1963 and has been teaching Philosophy since 1960. I would bet on Drange knowing a hell of a lot more about matters of God than you do. This argument is easily shown to be deductively valid in classical first order logic. Therefore, At least one predicate (omniscience) is not an attribute. Since it can be shown that omnipotence is inconsistent, the God of theism is inconsistent and therefore God does not exist. Can God create a being that knows’ something that He God does not know? "As a student of Philosophy, I do not consider any scripture as authoritative." I don't expect you to accept scripture as authoritative. As a student of philosophy, I would expect you would understand my earlier explanation. If Drange is trying to disprove the God of the Bible, and he is, then he has to use definitions from the Bible or accepted Christian theology. If he fails to do that, he is using a straw man argument which is not valid. I am surprised you cannot grasp this simple point. If Drange wants to disprove the Gods of Boethius or Wolterstorff or Epicurus, he is welcome to do that and he must use their definitions of God's attributes. You cannot expect Christians to be interested in the discussion because the discussion does not affect their beliefs. The problem is that #2 cannot be shown. Check the history of philosophy. Every attempt has failed. Regarding you comment "Can God create a being that knows’ something that He God does not know?" This reminds me of the classic question "Can God create a rock so big he cannot lift it?" You do not understand the difference between Philosophy and Theology? Drange, Rowe, Gale, Everitt, and Martin are philosophers writing philosophy books and essays. What makes you think that any of them is setting up a straw man argument just to attack the triune God of Christianity? You obviously cut and pasted Drange’s argument from http://www.philoonline.org/library/drange_1_2.htm. There is nothing in this paper that suggest he is directly arguing from the stand point of a Christian God. He is a philosopher and his arguments are well understood in the Philosophy of Religion community. The theistic God is well understood from the philosophers worldview, this is the God that Drange, et al are arguing. You should define with precise attributes your concept of what ever God you are talking about. Are you using God as a proper name or a title, is he/she a triune God, is your God eternal or everlasting? After you have provided such a characterization of what you are referring, show some evidence such that an entity is an actual metaphysical reality. My reply to your objection to my premise #2, which btw was support only by an opinion. 2. God essentially does not change from one time to another in respect to any nonrelational property (immutability). 3. There are true temporal indexical propositions (A-Prop) to the effect that certain events and or times are now past, present or future. 4. It is conceptually impossible for a timeless being to know an A-Prop. Premises1 and 5 are a contradiction, God is and is not omniscient. (Gale 58, On the Nature and Existence of God). My question regarding “Can God create” is not the paradox of the stone. A suitable defense has been given to the paradox, in that God can only do what is logically possible. There is nothing logically impossible about God creating a being that knows more than him. So how do you answer the question? I have taken three terms of Philosophy of Religion, there is always at least one Christian who like you just can not get their head around the traditional idea of Western Theism and Atheism. I have not read anything from Drange except the link provided by Matt. I have no idea what God Drange may or may not have been trying to refute. But Matt is obviously trying to refute the God of the Bible. 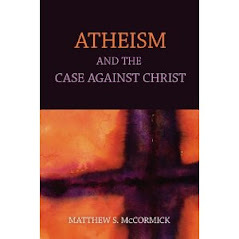 His book is titled Atheism: The Case Against Christ. So it is ridiculous to try and argue that the God of the Bible is not the God in question. If the God of the Bible was not the God in question, then I would not even be here. To answer your question, God can only do what is logically possible. Since God knows all, it is impossible for him to create a creature that knows more than he does. I had really hoped I would get a higher level of discussion from this website. Since I really do want a higher level of discourse, I will help you think through your options. 1. If you still think the argument is valid, then find some passage in the Bible that shows God is restrained by time... or find statements by Christian theologians that say the same thing. This is the only way to advance this particular argument. 2. If you still think the argument is valid but do not have the time to locate the needed passages, then say so and put the argument aside until you have the data in hand. Until you have the data, you can move on to your next strongest argument and we can discuss that argument. 3. If you see my point and do not believe it is possible to find passages in the Bible or in Christian theology saying God is restrained by time, then you can concede the point and move on to your next strongest argument. Quoting you “if you think any of the Incompatible Properties Arguments put forward by Drange are valid, then you are mistaken.” and “I have not read anything from Drange”, so you admit that you had an ad hoc bias and are epistemic bankrupt. Why don’t you directly refute Dr. McCormick, instead of just making up a bunch of non-sense. I referenced Augustine, Boethius and Wolterstorff’s all Christian Theologians, which I have read and who address the concept of God and time. I understand their argument, but you sir do not! I have also read Aquinas, Anslem, Descartes and Hume. I have a basic understanding of Tertullian (160-230 CE) ( I believe it because it is impossible) and fideism, the belief that faith is independent of reason, in contrast to the more rationalistic tradition of natural theology.“What indeed has Athens to do with Jerusalem?” This question of the relationship between reason—here represented by Athens—and faith—represented by Jerusalem. Please show how the Bible and/or scripture is authoritative. Finding something in Dr. McCormick book that you can actually argue against. Each time you answer you fail to deal with the arguments I lay out. I have already admitted I am a Christian so, of course, I come to the discussion with a bias. So does Matt and so do you. My arguments are not bankrupt. You have just failed to consider them. You have mentioned Augustine, Boethius and Wolterstorff, but you have not cited any passage by them that says God is restrained by time. And, even if such a passage was found, the requirement I set out was that the teaching had to be held by a majority of Christian theologians. There was much error in early Christian theology on some very basic issues. Several councils had to be called to hammer out basic issues such as the divinity of Christ and the Trinity. The possibility of God ever being constrained by time never made into one of these councils because there was never a time when enough people taught the position for it to be controversial. The issue is not that the Bible is authoritative for your life. The issue is that the Bible is authoritative for what Christians believe. If you want to refute a Christian idea, you have to define it the way Christians define it. If not, you are refuting a straw man argument and your goal is not achieved. Why is that so difficult for you to understand? The first comment on this thread, details a YouTube discussion I had with a Catholic priest and another user. In that post I asserted that we were epistemic peers. During a very long dialog the Bible was not discussed or was an issue. Regarding Augustine, et al, I am not going to your homework for you. A few comments ago, I challenged you to give some attributes of your Christian God and provide some supporting evidence of such a Deity. I am only arguing in favor of a philosophical position of atheism. How can I setup a straw man position when I don’t have any idea what your Christian belief systems entails. At this point I would not consider you a peer. If you want to continue this thread, you can start by answering a couple of basic questions: 1) What do you believe and 2) why do you believe it. Here's where I think Drange's argument fails. #2 "Edinburgh is to the North of me". #2a "Edinburgh is to the North of David Evans". #1a "Christmas 2012 is at an earlier time than the time when David Evans uttered #1"
I appreciate the time and thought that many of you are putting into this conversation. There is, in fact, a deep tradition of philosophers engaging in deductive atheology, or arguing that various properties alleged to be possessed by God are either internally incoherent or they are logically incompatible with some other property. At least since the Middle Ages, these debates have led theologians and philosophers to improve on their descriptions of what sort of being God might possibly be. The well known Stone Paradox, for instance, has led the vast majority of people who take this project seriously to abandon the claim that God, if he exists, will have the power to anything, including logically possible acts. The widespread conclusion among theologians, philosophers, believers, and non-believers, is that we must restrict omnipotence to mean the power to do anything that is logically possible (at the least.) But even beyond this revision, numerous problems have been uncovered with this new definition. Currently, the state of the discipline is in some chaos because we do not have a plausible account of omnipotence that is both suitably powerful to be attributed to God and that does not fall prey to serious counter examples and logical problems. Your statement: God is timeless and omnipresent. This statement is contrary. They both can not be true but both can be false. Wolterstorff (God Everlasting) states God is temporal and not eternal in the strict theological tradition. He defends a position that God is everlasting. A different concept of an eternity is simply to be everlasting, existing in time but having neither a beginning nor end. God is fundamentally non-eternal (God Everlasting). Wolterstroff’s discussion demonstrates God has a time-strand and his life and existence is itself temporal. Wolterstroff’s thinking is in the traditional Christian theistic view that God’s relationship to mankind is temporal, spatial, and anthropomorphic. Drange’s argument is immutability vs omniscience not timeless vs. omnipresent. If Wolterstorff’s characterization is true then Drange’s argument is sound because God can not be immutable and omniscient. Great way to frame the issue, Prof. McCormick! I have a question, though: Given the Judeo/Christian/Islamic worldviews, and the vital importance of belief in the correct God they entail (see God’s commandments! ), Isn’t anything but option (1) out of bounds on this issue? I.e., if it is a toss-up, and both “epistemically permissible” (EP) to believe neither in Jesus’s resurrection nor God, but also just EP to believe in Jesus and God, then it seems the “problem of evil” becomes relevant and tips the scale of rationality towards non-belief (because of the contradiction between the theists definition of ‘God’ as both omnibenevolent and as a condemner of atheists to eternal Hell for holding epistemically permissible beliefs, and for convincing others to adopt their pagan rationality). I.e., there appears no rational middle ground if theism is viewed seriously, given the detailed nature and (moral) seriousness of the theists proposed worldview; the theists needs a knock-down, home run of an argument, or else theism (and the Judeo/Christian/Islamic tradition) just seems to be one large cosmic conspiracy theory (and, rationally, almost certainly a false one at that). Professor Kirby, who is a secular humanist, thinks theist do have an epistemic right to their beliefs. If we take William James’ ‘Will to Believe”, Richard Taylor on Faith, Wittgenstein’s fideism, Plantinga on reformed epistemology seriously then Christians can not be considered insane. If two people are epistemic peers, say a student of philosophy and a seminarian student, the best that can be hoped for is a reasonable disagreement. The problem is the everyday lay Christians (fundamentalist or liberal) does not defend their faith, with the justification for their beliefs with an understanding of the above mentioned source of knowledge. For the most part Christians just base their defense on the Bible or by God did it and that is that. Those Christians are delusional , suffer from cognitive dissonance and could be considered insane. Hmm... Bob, I think you misinterpreted my comment. To sum it it up, I argue essentially that the (Christian) Monotheist has an enormous burden of proof resting on his shoulders, and "epistemically permisible" does not seem to cut it; anything less than "rational obligation" triggers the "problem of evil", which then obligates one, rationally, to dismiss (Christian) theism. Unless, of course, this POE is fatally flawed in some way (I know Prof. McCormick teaches a class dedicated to the POE, so hopefully he might weigh in on this). As a footnote, I take "epistemically permisible" to equal "plausability" or perhaps "logical possibility" and "rational obligation" to equal something like that of the belief that the Earth revolves around the sun--i.e. overwhelming rational evidence. We may as well start 2013 discussing theism versus atheism. We either have good reasons for thinking that Jesus came back from the dead or we don’t. If we don’t, as I allege, then Christianity is based on a grand mistake. Dr. Richard Feynman says “I can live with doubt and uncertainty, it is more interesting to live not knowing than to live with answers that may be wrong”. A fundamentalist, my brother for example, will not except either of the above precepts. First, he has confirmation bias, and will only consider evidence that supports the God hypothesis. He does have a “rational obligation” (Brad) for his belief, and the justification is citing, as any smart theist would, what I call the big three Fs. Second, based on the three Fs he will assert that his answers to the ultimate concerns are true. Here is my characterization of the big 3 F’s: Feeling, Fact, and Faith. Fact : Natural Theology, the cosmological, ontological, and teleological arguments. Faith : Fideism, faith is in some sense independent of reason. As atheist, we have sufficiently criticized each one of the three precepts. Unfortunately, any of the works of McCormick, Rowe, Gale, Everitt or Martin will be prima facie dismissed without consideration by the devout Christian. The theist will always have apologetic’s and theodicy’s. My wife claims that I will never change my brothers mind. I agree, the least I can hope for is his retreat licking his wounds. One of the new Atheist (Harris, Hitchens ?) said you can not argue someone out of a position that they did not argue themselves into. You write "Wolterstorff (God Everlasting) states God is temporal and not eternal in the strict theological tradition." In making this statement you agree that Wolterstorff's position is not within the Christian tradition. Whether you are correctly representing Wolterstorff or not, I do not know. But I do know the Christian position on God's timelessness. The Christian position is logically consistent. You cannot take a random view by one theologian and claim it is the Christian position. It is a straw man argument. You write "Currently, the state of the discipline is in some chaos because we do not have a plausible account of omnipotence that is both suitably powerful to be attributed to God and that does not fall prey to serious counter examples and logical problems." I cannot comment on the state of the discipline, but I can give you a Christian definition of omnipotence that I believe is unassailable. God is able to do anything that is logically possible and is not contrary to his nature. For example, the Bible makes it clear that God cannot lie. Being untruthful is contrary to God's nature. Being the creator of time, God is not constrained by time. Omnipotence is an attribute that only applies to God. If you show this definition of omnipotence is not logical consistent with his other attributes, please do so. You make a good comment. I agree completely. There are lots of sources explaining the omnipotence problems. The definition that you're giving, Ron, has been widely rejected by philosophers for decades, perhaps centuries. Too many problems. I have discussed the issues in previous posts, and I have given a link to a bibliography with lots more sources. You'll have to do your homework. A good place to start would be the Stanford Encyclopedia of Philosophy and the Internet Encyclopedia of Philosophy entries on omnipotence. Also Patrick Grim, Michael Martin, Drange, Sobel, Gale, Oppy, etc. Good comment, however, you stated that “The Christian position is logically consistent”, but did not assert what the position acutally is. In one of your previous post you said “The possibility of God ever being constrained by time never made into one of these councils”. This seems to indicate that the Christian position is inconsistent. Augustine, Boethius and Wolterstorff all have different claims regarding God, time, divine foreknowledge and how they justify freewill. Their postions are inconsistent. RE: God is able to do anything that is logically possible and is not contrary to his nature. This statement is an apologetics scape goat. It allows God to be anything, that anybody wants God to be. God can be defined at will. RE: the Bible makes it clear that God cannot lie. Being untruthful is contrary to God's nature. This statement indicates that hypostatic union of Jesus can not be true. If God can not lie, then if Jesus is God he can not lie, Jesus was not human, humans can lie. RE: Being the creator of time, God is not constrained by time. How is this logically possible? This needs to be developed into a logical argument. It can not be assert with out proof or evidence. Your answer is not helpful to me or to you or to anyone reading your blog. If you provide me with a reason to reject the definition I have given, I will show what is wrong with your reason. That's how arguments work. Or are you afraid I will do exactly that? You have spent a great deal of time looking at one side of the argument and no time looking at the other. Anthony Flew was a philosopher who knew all the arguments against God and wrote the book "There is No God." A years before he died, he changed his mind about God and wrote the book "There is a God." I'm certain there is nothing new in the arguments presented here that was unknown to Anthony Flew. If Anthony was not persuaded by them, I see no reason to believe I will be. You have made errors. I have attempted to point one or two of them out to you. Instead of attempting to further the argument, you say you are not going to do my homework. That comment does not fit the situation. If I was asking you to help me defend my side, it would be appropriate. I'm asking you to defend your side. You cannot tell me to do my homework to learn what your side it. It doesn't work that way. You have failed to show what is wrong with my definition of the omnipotence of God. That debating style does not inspire confidence. After a brief email exchange with Nicholas Wolterstorff, I think I understand his viewpoint that God is everlasting but not out of time. I think the correct view point is more nuanced than that. Time is a function of space and dimension. Just ask Einstein... or expert in general relativity. When God created our spacetime in the Big Bang, God was outside of it and independent of it. God is not constrained by our spacetime. 2 Peter 3:8 says "But beloved, do not forget this one thing, that with the Lord one day is as a thousand years, and a thousand years as one day." You do not have to accept this Bible verse as truth, but you do have to accept it as the historical position of the Christian Church. The Christian position is that God is atemporal with regard to our spacetime. But that does not mean everything happens at once in heaven. The Bible does not speak of this issue clearly and so the Christian teaching on it has some flexibility, but I believe it makes sense for heaven to have an arrow of time without beginning or end. It is my guess most Christian theologians and philosophers would agree with this definition. The result, I think, is that we cannot take him seriously if we are trying to figure out what's reasonable to believe. He's valuable, I suppose, for finding ways to sustain Christian beliefs in the face of all possible counter evidence and reasons, if you share that goal. But that precludes the rest of us from having any real rational exchange with him; he's left the playing field of rationality. You clearly have done some homework. 1) It is circular. “When God created our spacetime in the Big Bang” you are assuming what your trying to prove. 2) We have been discussing God’s attributes and have provide arguments that show that some predicates are inconsistent. 3) What is lacking in the thread is there is not evidence that is sufficient to demonstrate the certainty of a triune God. Let G = God exist. Let P = God has confirmed his existence to man with conclusive evidence. "1) It is circular. “When God created our spacetime in the Big Bang” you are assuming what your trying to prove." Not true. The argument is over whether God's attributes are compatible or incompatible. The argument itself assumes God exists for the purpose of trying to disprove his existence. If you want to refute the Christian position, you have to treat it honestly or you are refuting a straw man. I am simply explaining to you what the Christian position is. Not true. Arguments have been put forward but they fail as I have pointed out. True. Evidence for God's existence is lacking on this website, but that is not my fault. There is plenty of evidence for God's existence. That evidence is not found on these web pages. "One principle that is accepted throughout science and everyday life is that we should not believe in entities for which we have no evidence..."
You then go into an deductive proof which fails for several reasons. First, the standard is "conclusive conclusive." In the next post by Matt titled "Some Varieties of Disproof," he makes a case for a lower standard of evidence which I agree with. Secondly, your argument assumes you possess all knowledge and know that "conclusive evidence" (or possibly even "greater weight of evidence") for God's existence is not available. This is demonstrably false as rational people like Anthony Flew, Francis Collins, Allan Sandage, CS Lewis, Lee Strobel and many others have already been persuaded by the available evidence. You should know that the history of philosophy is strewn with the attempts to disprove the existence of God. They have all failed. Please explain your point of view to Bob. It was he who brought Wolterstorff into the conversation, not me. Although I invited Wolterstorff to comment here, I doubt he will. More to the point, Matt, you have failed to engage any of the arguments I have made. Perhaps we should start with that. When I cited Wolterstorff essay God Everlasting my point was to contrast his theology with Augustine and Boethius. Matt’s reponse was that Wolterstroff could not be taken seriously because of an ad hoc bias and he had left the playing field of rationality. That does not say much about following the evidence where every it leads.